Damn. Even though there is no Ash-type character, there is no shortage on blood and guts. Also, that does not make me want to get my tongue pierced anytime soon, and I audibly gasped with the close up of the string coming out of the eyelid. When will kids ever learn not to read from a creepy book when you're hanging out in a cabin in the middle of a heavily wooded area? So where do you stand? Are you digging the look of this remake? Or should Raimi have left his own property alone? 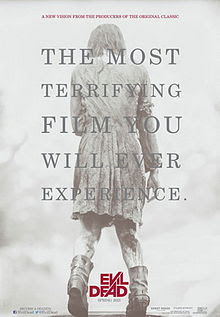 EVIL DEAD will be released April 12, 2013 directed by Fede Alvarez starring Jane Levy, Shiloh Fernandez, and Jessica Lucas.